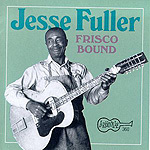 Jesse Fuller was one of the most distinctive artists in the history of the blues. His unique half-spoken vocals, his impassioned acoustic slide guitar, his strong harmonica skills, and his unusual excellence on kazoo and footdella make for a truly individual musical voice. The material on this generous (more than one hour) release is drawn from two sessions; one in 1955 in San Francisco, and the second in 1962 at Cornell University. The selection of material runs the gamut from his railroad hoboing songs like "Leaving Memphis," "Frisco Bound" and "Cincinnati Blues" to his famed "San Francisco Bay Blues" to traditional blues and folk songs such as "Motherless Children" and "Bill Bailey Won't You Please Come Home." All are delivered in that inimitable Fuller style of hummed/spoken/sung vocals that is so emotionally evocative. Fuller is an artist whose work was firmly embedded in the American rural folk tradition, and this overview of his career is an excellent introduction to his music.